Photo and text by Lindsey Johnson. 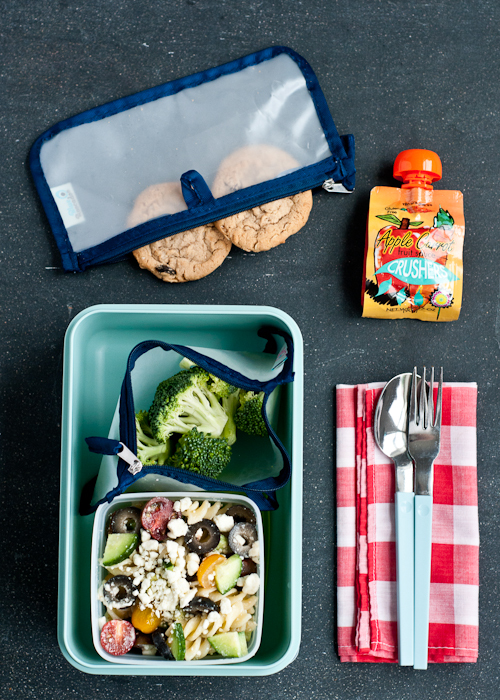 This week’s Menu #4 of our Lunchbox Menu Series swaps a sandwich for a pasta salad and loads up on healthy veggies and fruit. I’ve finally discovered the best pasta salad that is full of goodies and easy to adapt to your child’s preferences. Cannot wait to try that pasta salad! I’m a nanny that has to pack her own lunch daily, so I’m absolutely loving this series and hope it continues for a while! Thanks so much, Lindsey! Target even sells reusable food bags now. These lunch menus are the best! I’m stashing them away for when I have kids! My mom always took care to pack me a special lunch complete with a little note, I want to try and create that same feeling of being special when I have kids! This is such a perfect way to do that. The idea of swapping out a pasta salad for the usual sandwich is one I’ve wanted to try for a LONG time. Alas, my 2nd grader and Kindergartener are not open to anything other than their tried and true PBJs :(. Nonetheless, I may try that salad for myself…this is a fantastic series! my kids love those crushers from TJs! They bring home the caps so we can recycle them. I don’t understand the re-usable zippered bag. Its description on amazon says it’s made from PEVA film, which I had to google, but it’s still a petroleum-based plastic of some kind. I just wash out and re-use ziploc bags when I use them. Margo, great question! I had thought the same thing until I started using them. Of course, reusing the ziploc bags is fine. I prefer these because the plastic is a little stronger and I can wash them over and over. They don’t get holes as easily. Yes, they are a little pricey at first, but I have a friend who claims she’s been using her reusuable bags (a different brand) for over five years! I discovered pasta salad earlier this year, and it’s been my go-to dish. I haven’t been so happy with the dressing recipes, and have been using bottled ones. Can’t wait to try out this version! Thanks for sharing! Although your ideas are beautiful and healthy, this is not realistic! I don’t know of, and certainly not my own, any children who would eat raw broccoli or pasta salad that has everything touching! !